Rarely do I repeat a blog post - but many of my readers are off to the beach and want to start reading a book that they will not finish. May I suggest yet again Fatal Risk by Roddy Boyd - the story of the AIG collapse. Herbalife's streak of beating earnings guidance every quarter since 2008 is over. They missed this quarter - not by much - but it is a miss for a company that seems to grow like topsy. The shorts on Twitter/Seeking Alpha having spent some time saying that the numbers don't matter (just the business model) are now claiming some victory on numbers. Herb Greenberg (the only regular short I really have a lot of time for) stated that he thought the numbers don't matter but he now wants to assert meaning in the numbers. But lets examine them dispassionately. They want government intervention to shut the company down - but if it is a pyramid as such it will collapse on its own. New victims can't be found forever. In other words the shorts would like government intervention but they are not dependent on it. My view (and the long view generally) is that there is a huge amount of real consumption and real consumption is easily visible. Go to a few Herbalife distributors and you will see daily consumption. Lots of it. (I have visited Herbalife distributors in multiple countries and spoken to many more and I have yet to visit a Herbalife distributor consistent with the Ackman thesis). What you find is a sort of cult of weight loss. If you drink protein shakes and diet suppressing teas daily you will lose weight. The only problem is sticking to that diet. Enter Herbalife who provide a (for profit) community to help you to stick to that diet. The community combined with the shakes is the product. Visit Herbalife distributors and what you see is very large numbers of people who have entered or aspire to enter a routine of "daily consumption". Repeat customers are central to the bull case. If you get more of them earnings can grow for a very long time. Moreover it is very hard (nay impossible) to argue that someone who buys $100 worth of product, then in two months buys $100 more, and two months later buys some more and so on for years is scammed in the Bill Ackman sense. They know what they are getting. They are not deceived. The bull case - and it is a very strong bull case indeed - is that the daily-consumption tribe will continue to grow at mid-single digit for a very long time. You could wake up in ten years and earnings be $30 a share and the stock (say) $600. Imagine a company growing 10 percent per annum with a very high return on equity (so little capital is needed for additional sales). Moreover assume that the discount rate is 7 percent. Then try doing a discounted cash flow analysis. If you assume that the growth goes forever then the value of the company is infinite. So you must quite reasonably assume that the growth stops at some point. And the value of the company depends critically on when the growth slows. If it slows in 30 years it makes sense to pay a very big PE ratio for the company now. If it slows next year you will get crushed buying at a high price. Herbalife has grown fast enough since 2008 that you can engage in fantasies as to its ultimate valuation. Revenue in 2008 was $2.3 billion. It is now over $5 billion. And until the first quarter of this year it was growing uninterrupted in every geography. And the growth was volume growth - not just revenue. Moreover the potential market is huge: fat people. This company sells roughly 10 percent of the number of "meals" as McDonalds but it sells then to far fewer people (mostly daily consumers). The potential number of daily consumers is a large multiple of the current number. The enormous growth does enable fantasies. This stock could be very good indeed. Herbalife was growing, quite fast, in all jurisdictions in all quarters until very recently. Volume growth was 11 percent in North America, 16 percent in Europe, Middle East and Africa, 33 percent in South and Central America and 49 percent in China. It was 1 percent in Asia Pacific - which mostly means Malaysia. But that was after years of torrid growth. Jokingly I suggest: try putting those numbers into your discounted cash flow analysis. Moreover the sales growth per active sales leader is increasing in many markets. This means that mid-level distributors are getting paid more. That makes for a happy network. In the first quarter of this year Herbalife had its first slowdown of any kind. These numbers shocked me to the downside and my position has been smaller ever since. Note the sales decline in Asia Pacific. This was the first sales decline in any region that I remember. The point is that if sales are shrinking in one region they may in turn shrink in any region. It means the growth that seemed bullet-proof from 2008 to 2013 was no longer bullet proof. Moreover the sales leaders grew faster than sales. This meant the income of mid-level distributors was starting to get pressured. This is not good news. Still North American growth was high (9 percent, not double-digit) and China was off-the-scale good. These are not the numbers of a stock trading at a 10 times forward price earnings multiple. But they are no-longer the numbers that allow me to indulge $1000 a share fantasies. To get to $1000 a share in any reasonable time-frame growth numbers have to be impregnable. They clearly showed some vulnerability. The sales decline it appears was almost entirely in Malaysia where one explanation on the ground is that they had a new competitor. Malaysia was at the time the number one market in the world for Herbalife according to Google Trends. Trends in Malaysia had been unbelievably good. Malaysia for the unaware (meaning most my readers) has a different typical Herbalife distributor to (say) New York. New York tends to have "nutrition clubs" which feel a bit like down-market coffee shops where people sit around and drink shakes. The shtick is that you turn up in a public park on a weekend morning and you do fitness classes. The first class is typically free. They are hard work. Over time they sign you up for both paid fitness classes and Herbalife shakes. There is a quid-pro-quo. The fitness classes also have evening social outings - dances which serve multiple functions: weight loss support, Herbalife cult-revival, matchmaking. There are several vidoes on YouTube of these. The second video shows something that I have never seen elsewhere - women in full Muslim dress dancing. This is a different image of Herbalife: part bootcamp, part fitness club, part diet club, part dance party. There are many hundreds of people at some of these clubs. These are reasonable sized businesses. There is one of these clubs in Sydney now - with a Malaysian upline. See the 24 Fit Club. It is clearly a Herbalife club - but the meal plan is only part of what they sell. Anyway an ugly sales decline in Malaysia was a decent sized kick to the Herbalife fantasy. If sales declined sharply in one market because of competition - especially when the market looked so viable - they could decline everywhere. It was impossible to project growth forever. 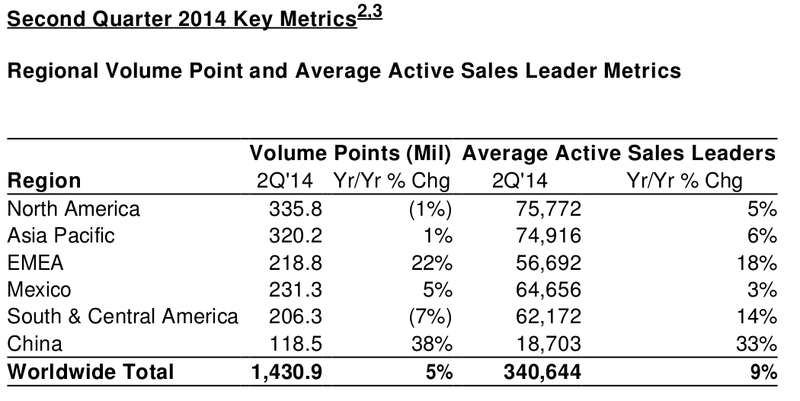 This quarter the sales growth by region does not look anywhere near as good as in the past. Notably there was a sales decline year on year in North America. That is a first. And there was a sharp sales decline South and Central America. This is clearly evidence that growth at this company is no-longer a given. Fantasies of enormous stock prices become more difficult to support. However the observant will notice that Asia Pacific grew quite substantially (6 percent) quarter on quarter even if the annual growth rate was only 1 percent. According to the short thesis this is not meant to happen. These things are meant to implode like Ponzis, not stage resurgences. The resurgence is particularly notable because it seems that the competitor did not gain traction: the network effects of Herbalife are particularly strong. That is bullish. Moreover whilst Herbalife sales have some seasonality (people want to lose weight for summer because of bikinis and the like) Malaysia is - climate wise - probably the least seasonal market possible. It is just hot there. So there is not a seasonal driver here. Volumes are essentially flat quarter on quarter in North America. Its annoying and a challenge to the bull thesis but it is not disastrous. By contrast the quarter on quarter declines in South America were quite sharp. I am wondering whether this looks like Malaysia last quarter or whether something else is happening. Whatever: as a Herbalife bull it is not good news. This stock remains less than ten times forward earnings. Volumes are still growing 5 percent though that volume growth is down from 14 percent a year ago and the numbers no longer look impregnable. Incremental ROE is high - and there is a huge runway for growth in Asia and China. They buy back their shares with their profits. The management are focussed on returning profits to shareholders through buy-backs at least in part to drive out the shorts. I can think of no other business with that sort of volume growth, such a high incremental ROE and equity shrink. This is a great stock. Just not as great as it was before. The upside has shrunk. No question about it. But I can imagine few worse shorts. I have visited many Herbalife distributors and the Ackman thesis is supported nowhere. And the shorts flit between the numbers not mattering and the numbers being critical. The numbers do matter. They are not as good as they were. The upside is capped at a lower number but still closer to $200 a share than $100. I think I can wait. Just not as happily as before. Disclosures: I purchased some in the morning of Ackman's speech. I turfed some later in the day (and I am not normally a day trader). I repurchased some of those in the after-market today. The core holding is much smaller than it was last year - but it is still meaningful and we intend to sit on it a very long time. In the conference call they revealed that Venezuelan sales were down 40 percent. They had previously had trouble getting cash out of Venezuela and ran the risks of assets there being nationalized. This was a rational reduction in sales. Brazilian sales were down 1 percent - completely coincident with the World Cup. It seemed Brazilians wanted to party, not to diet. The rest of Latin America grew nicely. Bill Ackman has made something of my visit to a Herbalife club in his presentation. I have visited several. And I have a radically different interpretation. But for the moment I just want to tell Bill Ackman a story. In my lifetime in Australia it was commonplace to take children of mostly of mixed aboriginal racial heritage from their mothers and adopt them into white society or even to leave them in welfare homes. This was done for the children's welfare, usually but not always close to birth. But there are stories of children aged four being hidden from the welfare because the kids would be stolen. Stealing children had widespread social acceptance in Australia. The condition in which the aboriginal people lived was very poor - often rural, often quite lowly educated. And you hear stories of children aged 12 in middle class rural towns saying they have never met an aborigine and being told to look in the mirror (because they were aboriginal). This wasn't a genocidal society. Indeed at the same time Australia had a massive multiethnic immigration program running. It just became the view of the liberal intelligentsia in the city (people who were utterly disconnected I might add) that this was welfare improving. Like you Mr Ackman I am instinctively more than a touch paternalistic liberal. This was done by and supported by people like me. And dare I say it people like you. The liberal intelligentsia came to this view however without ever talking to an aboriginal mother, without listening to their stories, without actually seeing what their policy looked like on the ground. With our modern eye on this the church groups, rotary clubs, welfare agencies and the government were all deeply racist. They separated children from their mothers against their mothers wishes and did not listen to value their stories because they were different from them, had different colour skin and sometimes spoke in a different language or broken English. I have - when all the historic inquiries into this practice - took place read the literature and wondered whether - reading it then - whether I would have seen the program for what it was. Pure evil. I have come to the conclusion I wouldn't have. There is an underlying misunderstanding of what is different in all of us. I too would have been an evil person by my implicit support for evil. But I resolved then to always listen to the stories that people told me even when it offended my sense of decency. Let me tell you about a Herbalife club in the Bronx. This had real customers - about fifty per day which is fairly standard - who came along and purchased their shakes and sat around and chatted. It was like many other Herbalife clubs that I have visited. There was a grid on the wall with the names of the regular attendees, and gold stars against their names for when they lost the requisite amount of weight. You could do the calculation and work out that husband and wife who ran this club were earning marginally less than minimum wage for the time that they were there. They didn't have much of a downline. A few of their customers purchased shakes at home for personal use - and they got some income from them. But for people who were modestly entrepreneurial it was almost sad - it certainly offended my sense of what is the right distribution of income to see them working so hard for so little. At first for me it was a little like poverty-tourism - the sort of poverty tourism you see when you visit small towns east of Battambang (Cambodia) or for that matter Arakun (a somewhat dysfunctional aboriginal town in Northern Australia. But just as I would have been deceived by a welfare program in that aboriginal town I made a point of listening to the woman who ran the shop. And what I heard surprised me. A husband and wife had been running this club for about fourteen months - and yes - they worked out that per-hour they made slightly less than minimum wage. They opened the club as a couple in the morning and he took the children to school and went to his minimum wage job. She ran the club, her friends came by. Most importantly after school her friends dropped her children off along with their own and went to their minimum wage jobs. There were a pile of toys in the back and the place looked a little like a creche. The kids played well - and yes - one of her customers - in full knowledge of the financial circumstances was going to start a similar business a few miles away. When I asked her about whether this was a pyramid and should be closed by the government she was hostile. She knew about you Mr Ackman but her attitude was that you wanted to take her children away from her. I could not help but be struck by the parallels. This is not a pyramid. There are plenty of real sales to real people. That is visible. Its a lousy business but it is a business in which people have integrated their lives and their families. If it were Australia I would not hesitate to call the unwillingness to listen to the stories of the poor people of different race what I called it then: racism. In the US it is probably not that. US attitudes to Hispanics are far less racist than Australian attitudes to our aboriginal population. In the US it is just money/class and the separation of the 1 percent from the masses. It is entirely possible to be from Manhattan and the Hamptons and completely lacking in empathy for people whose income is near minimum wage. When I listened to people at Herbalife clubs I heard a story completely different from the story you tell in your presentations. It is a story about people who have integrated this business into their life. About people who have found community. And about people who have controlled their diabetes. Its a story you don't present. And not hearing it or presenting it reflects badly on you. The first Herbalife distributor I met told me - with a completely straight face that Herbalife cured diabetes. If I put this - and the first ten seconds of discussion into a video it would look really bad. But dig deeper: his wife had gone from balloon shaped to merely rectangular. She had lost 80 pounds (which was huge give how short she was). She was insulin dependent diabetic both before and after Herbalife. But before she lost the weight she was taking three decent insulin shots a day. Her life expectancy was probably 5 years. After she lost the weight (and it was a lot of weight) she had far better control of her blood sugars. Her life expectancy was probably 15+ years. Better than it was. Certainly less good than if she was not insulin dependent. I could have edited a video any way I like. But I saw believers, real consumers and real good done. PS. Bill, you must have seen examples like that. Do you want her to die? Just asking. Valeant Pharmaceuticals Part VIII: product sales distribution from the department of "really". 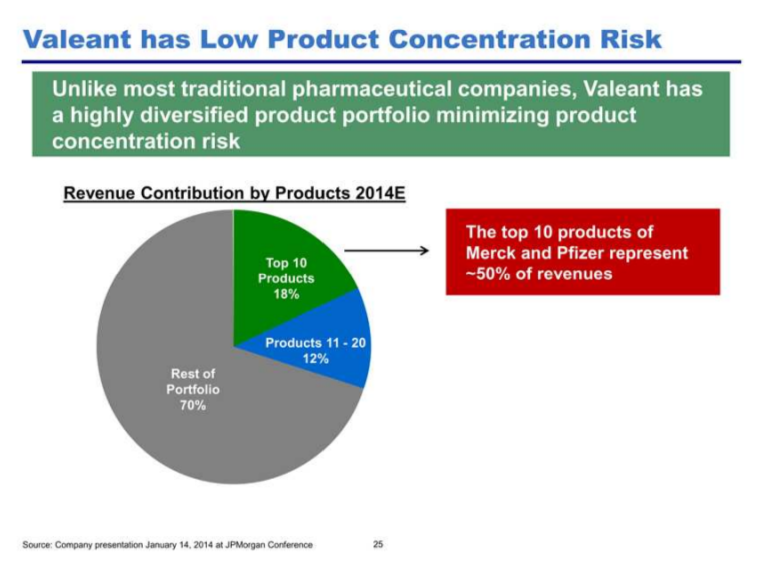 A key part of the Valeant bull case is that they are extremely diversified as to their product mix and that diversification reduces the risk of competitor products or patent cliffs. The top ten products - according to this slide - are 18 percent of sales. The next ten 12 percent of sales. This is much less concentrated than traditional pharma: at Merck and Pfizer the top ten products supposedly represent approximately 50 percent of revenue. But like all stock market numbers I like to put them through the plausibility test. What we are saying is the top ten products average 1.8 percent of sales each. The next ten average 1.2 percent. Now lets just - for the sake of argument suggest that the top product is 3 percent of sales. And the next four average 2.3 percent. Well then the first five are 12.2 percent of sales - and the next five can only be 5.8 percent of sales (or they average 1.16 percent of sales). But oops, that is too much concentration - because we know the next ten average 1.2 percent of sales. In fact it is far too much concentration as product number 11 needs to be more than 1.2 percent of sales. I have fiddled with these numbers and they imply a distribution of sales flatter than I have ever seen in any product or category. In order to make the numbers work the differences between product sales have to be trivial all through the first fifteen products. And remember these products treat a wide variety of ailments. Products injected in a dermatologist's office have a different sales profile to say acne cream or psoriasis treatment or the treatment for cold sores or herpes simply because there are different prevalence of these conditions in the real world and a different willingness of people to pay for product. The real world is has skew. Except that at Valeant everything is as flat as a pancake. Far more perfectly even than almost any real world distribution I have seen for a variable with as wide an underlying diversity as medical ailments. Sorry for the absence. Travel for work and holidays intervened. PS. Cycling holidays in Croatia (call Dejan from Red Adventures) is an almost perfect solution for what to do with a teenage son who needs adventure and exercise and a wife who wants great food and historic places to explore. I cannot recommend this more highly. Oh, and if the wife wants an electric bike Dejan will organize that too. We island hopped through the Dalmatians and finished in Dubrovnik. This is an off-the-scale good trip and doesn't break the budget. Just do it. Alas the Islands of Hvar and Korcula have more hills than Valeant's product distribution.